For the past two decade, Sensei Darwish has sought to extend the teachings of Daitō-ryū Aiki-jūjutsu from Japan, and is an integral branch of its lineage. He founded Daitō-ryū Koryukan in 2008 as an independent organization. The name “Koryukan” can be translated as light , higher or advanced learning, or traditional place of the samurai art. Sensei Darwish became the Hakuho-ryū Aiki-Budo representative in Canada in 2002, and he continues to perfect his art by training annually with Ozeki Shigeyoshi Sensei in Fukuoka, Japan. 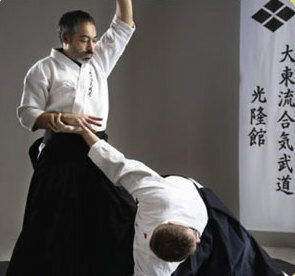 Additionally, he has been awarded Shihan license (Japanese Honorific Title) in Daitō-ryū, Shihan in Yamato Tenshin Ryu Bojutsu and 12 generation Shihan holder of a teaching Mokuroku in Heihō Niten Ichi-ryū, an ancient double-sword technique founded in the early 1600s by the famed samurai, Miyamoto Musashi—who remained undefeated in over 60 battles. Sensei Darwish strongly believes that Daitō-ryū has the potential to transform the practioner towards a balanced mind and body, so that a person may better face everyday challenges that life sends our way. He has dedicated his life to spread the teachings of Daitō-ryū, and to build a community upon respect, courage, honesty and camaraderie.